Amaryllis Misty is not a huge plant and the flowers are smaller than standard Amaryllis. They can also produce several flowering stems in one season. 'Trumpet' Amaryllis are so named for their trumpet shaped flowers which are less flat and open than standard varieties. In fact, they look more like regular lillies. 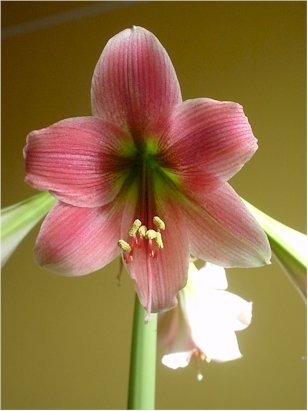 Shown below, is trumpet Amaryllis 'Misty', which is one of the few trumpet cultivars available. The pale pinkish flowers have raspberry striped that are apparent only when viewed up close. otherwise, the flowers appear to have a misty pink appearance from a distance, hence the name. They are also lightly fragrant! The flowers also tend to hang down once opened. This is apparent in the photo below-look at the blooms in the background. For this reason, it is suitable for display on a higher table, such as a dining table, where the elegant blooms can be much admired.